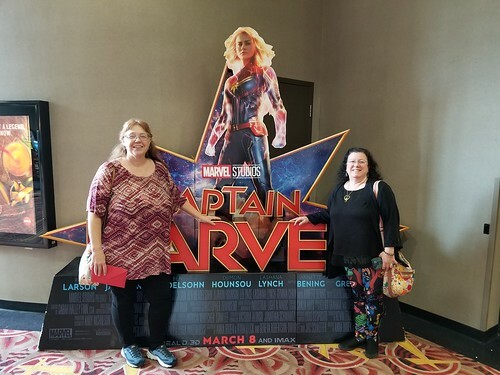 I had a great Sunday: slept late after turning the clocks forward, ate brunch, went to Woodbridge with Paul and Adam where we met Cheryl to see Captain Marvel, which was awesome from the Stan Lee cameo on out. Sure, some parts of it are reminiscent of Black Panther and Wonder Woman -- these are all superhero origin stories, people might as well complain that too many Greek, Norse, and African myths have similarities -- and I'm a little confused by the people who found the beginning confusing, I thought it was obvious what was going on even if we didn't know why yet. I thought Larson was great and Jackson was enormous fun, and I want more Annette Bening in more Marvel movies.